The most important economic activity in Ontario is manufacturing, and the Toronto–Hamilton region is the country's most highly industrialized area. The area from Oshawa, Ontario around the west end of Lake Ontario to Niagara Falls, with Hamilton at its centre, is known as the Golden Horseshoe and had a population of approximately 8.1 million people in 2006. The phrase was first used by Westinghouse President Herbert H. Rogge in a speech to the Hamilton Chamber of Commerce, on January 12, 1954. "Hamilton in 50 years will be the forward cleat in a golden horseshoe of industrial development from Oshawa to the Niagara River ... 150 miles long and 50 miles (80 km) wide...It will run from Niagara Falls on the south to about Oshawa on the north and take in numerous cities and towns already there, including Hamilton and Toronto." 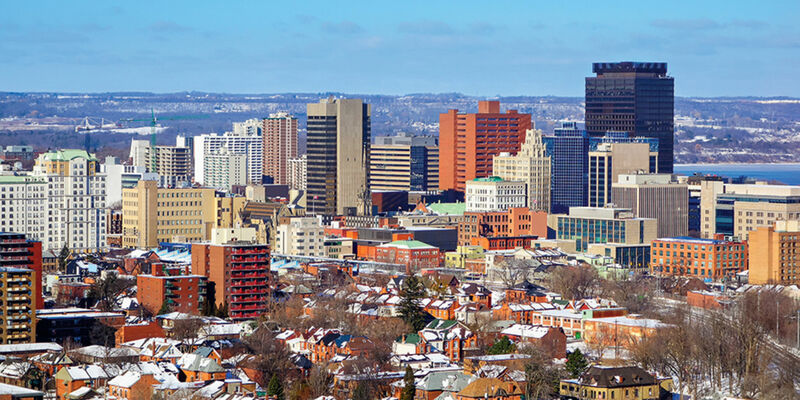 With sixty percent of Canada's steel being produced in Hamilton by Stelco and Dofasco, the city has become known as the Steel Capital of Canada. After nearly declaring bankruptcy, Stelco returned to profitability in 2004. On August 26, 2007 United States Steel Corporation acquired Stelco for C$38.50 in cash per share, owning more than 76 percent of Stelco's outstanding shares. On September 17, 2014, US Steel Canada announced it was applying for bankruptcy protection and it would close its Hamilton operations. A stand-alone subsidiary of Arcelor Mittal, the world's largest steel producer, Dofasco produces products for the automotive, construction, energy, manufacturing, pipe and tube, appliance, packaging, and steel distribution industries. It has approximately 7,300 employees at its Hamilton plant, and the four million tons of steel it produces each year represents about 30% of Canada's flat-rolled sheet steel shipments. Dofasco was North America's most profitable steel producer in 1999 and the most profitable in Canada in 2000 as well as a long-time member of the Dow Jones Sustainability World Index. Previously ordered by the U.S. Department of Justice to divest itself of the Canadian company, Arcelor Mittal has been allowed to retain Dofasco provided it sells several of its American assets. In the 1940s, the John C. Munro Hamilton International Airport was used as a wartime air force training station. Today TradePort International Corporation manages and operates the John C. Munro Hamilton International Airport. Under TradePort management, passenger traffic at the Hamilton terminal has grown from 90,000 in 1996 to approximately 900,000 in 2002. The airport's mid-term target for growth in its passenger service is five million air travelers annually. The airport's air cargo sector has 24–7 operational capability and strategic geographic location, allowing its capacity to increase by 50% since 1996; 91,000 metric tonnes (100,000 tons) of cargo passed through the airport in 2002. Courier companies with operations at the airport include United Parcel Service and Cargojet Canada. In 2003, the city began developing a 30-year growth management strategy which called, in part, for a massive aerotropolis industrial park centred on Hamilton Airport. The aerotropolis proposal, now known as the Airport Employment Growth District, is touted as a solution to the city's shortage of employment lands. Hamilton turned over operation of the airport to TradePort International Corp. in 1996. In 2007, YVR Airport Services (YVRAS), which runs the Vancouver International Airport, took over 100 percent ownership of TradePort in a $13-million deal. The airport is also home to the Canadian Warplane Heritage Museum. A report by Hemson Consulting identified an opportunity to develop 1,000 hectares (2,500 acres) of greenfields (the size of the Royal Botanical Gardens) that could generate an estimated 90,000 jobs by 2031. A proposed aerotropolis industrial park at Highway 6 and 403, has been debated at City Hall for years. Opponents feel the city needs to do more investigation about the cost to taxpayers before embarking on the project. The Hamilton GO Centre, formerly the Toronto, Hamilton and Buffalo Railway station, is a commuter rail station on the Lakeshore West line of GO Transit. While Hamilton is not directly served by intercity rail, the Lakeshore West line does offer an off-peak bus connection and a peak-hours rail connection to Aldershot station in Burlington, which doubles as a VIA Rail station. Updated: 26th April, 2019 5:52 AM.